I was able to purchase a super jumbo size duo of the Paul Mitchell Extra-Body Shampoo and Rinse for $30. My 15 year old daughter has overdyed hair to her shoulders and my 16 year old son has a buzz cut and they both really like this set. You do need to wash twice to get the cleanest hair, but it really works well. Her hair is always soft. I don't know if it adds extra body, but it is a great shampoo regardless. 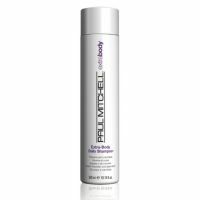 I love Paul Mitchell products and have really started purchasing other ones in the line to fall in love with them and review them. I purchased the Extra-body daily shampoo and two others that I'll review later and absolutely love it! I always love Paul Mitchell packaging because it is simple and has a unisex look to it so my husband doesn't mind having it around our bathroom. First thing I noti...read moreced about this is definitely the smell- It is AMAZING! It has such a soft, relaxing smell but I have no idea what the notes are but it's so calming for me; I used a quarter size dollop for my hair and washed my hair as I usually do from scalp to mid shaft and let the water rinse it out to my ends. After styling my hair I noticed my hair felt fuller and thicker and I almost felt like it was too much. It really does give me a lot of volume! I am only going to wash my hair with this shampoo when I go out that night or following day because I would not want that amount of thickness for the low buns I have to have for work everyday. I purchased this in the travel size that's under $4 to make sure I would love it before I committed to the big size but as soon as I run out of it I'll be purchasing the regular size and keep refilling my travel size. I don't think I'll ever be disappointed with any Paul Mitchell product; they all smell great, are well priced, and do what they say. The bottle says "...super body-builder.." and that's EXACTLY what it is! Great job Paul Mitchell!